Hello, I'm Gregor and I put this site together. 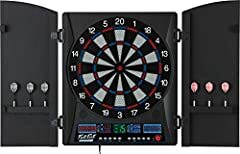 At first, you'll find an overview of recommended electronic dartboards, followed by a public poll and a general buying guide on electronic dartboard. 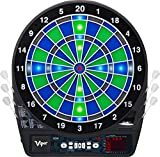 Further down on this page, we do link to other well-written articles and reviews about electronic dartboards. At last, you'll be able to weight in your own opinion in the comments section. If you also want to vote on the best electronic dartboard, click here to view the poll. The game of darts has been around for many years not only in public places but also in homes. It is a great game to play with the whole family, many friends, strangers, or whomever you choose. 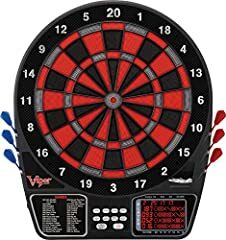 Over the years, the game of darts itself hasn't changed much but the board that it is played on has. Here we will discuss only the electronic dartboard, different features to look for when you are buying one, and I will give you the top five for different levels for 2018. 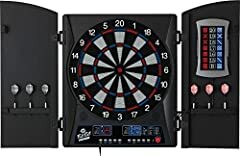 When you are looking to purchase an electronic dartboard, there are some things that you need to do first. You should always do your research and decide which features you cannot live without as well as those you can live without. Also, you will want to set a budget. Setting a budget will help you greatly as the purchase of the dartboard, darts, and anything else you may need can get rather expensive. how many people or teams are you going to have playing at one time? Think about the number of people in your family that will be playing at one time, even extended family at holiday times. Number of games: how many games are you wanting? Are you going to get bored with just a few or are you going to want to learn to play many? Think about everyone in your family that will be playing and make sure that everyone will be happy with the amount of games. Construction: Is it built to reduce the bounce out rate? This is vary important as it will keep the frustration level down when you are playing. 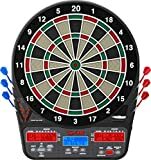 Noise Reduction: Is there a way to turn the noise down or reduce the noise on the electronic dartboard? 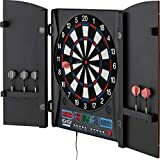 Space: Do you have a place to mount your dartboard securely to the wall with enough space in front of it to throw the darts where people will not be crossing your path? Location: Are you going to put your new dartboard at your house or at your business? Power: Some electronic dartboards can run on only two AA batteries, others run on only an AC adapter. Others run on both which is probably your best bet encase you would like to take it somewhere where there is no electricity. Packaging: What all comes with your electronic dartboard. Make sure to check to see if it comes with darts, extra tips, an instruction booklet, a year warranty, a mounting kit, etc. There are electronic dartboards made especially for kids. They are smaller than regulation size which does make them somewhat easier for little kids to use. There are some benefits to kids playing darts such as it will help with hand-eye coordination, helps them learn to focus, and could help them with patients. If you are wanting to play online with people in other location then a cyber play board is what you would be looking for. This board gives you the opportunity to link up with other teams or people who are doing the exact same thing you are. Basically you could have a never ending tournament. 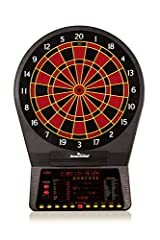 For those of you who are professionals or like to do things by the book or just want the right size electronic dartboard, then you will go with the regulation size. This is the same size that you see in public places everywhere and is the most common. It is probably the best to learn on if you are ages twelve and up. 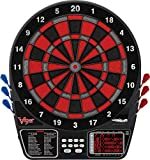 This electronic dartboard is a good investment for people ranging from beginners to professionals from age twelve and up. It does come with 39 different games and 179 variations which gives you so many options to have fun with. Also, you are able to have 8 people playing at one time which gives you room for your whole family or many friends. 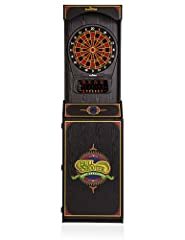 This Electronic dartboard comes with a cabinet that holds six darts and six spare tips. It comes with 38 games and 167 different scoring options giving you many ways to change up your game. Also, you are able to have 8 people playing at once which gives you many options as well. 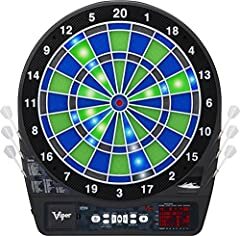 This is considered a Bluetooth dartboard that is able to be ran on an application. It is however compatible with Android, iOS, and Smart TVs which is helpful since most people have these devices anyway. It does come with a step by step instruction manual which makes for easy set up. In order to turn this dartboard on, you will need to use 2 AA batteries. 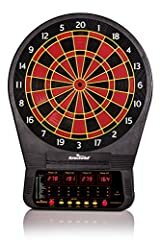 This electronic dartboard is also a soft tip dartboard. It is one of the few that has a large catch ring around the dartboard itself to protect your wall. It comes with 57 games and 307 scoring options which gives you even a wider range of options to choose from. Also, you are able to have 16 players on here at once which is great if you have a bigger family or are having a party. 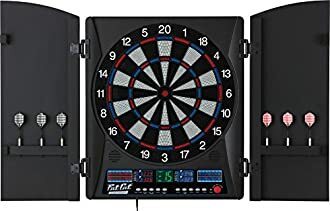 Also, if you are looking to become a professional, this dartboard has a laser light built into it which will give you the right distance to where you are suppose to be standing when throwing your darts. This is also helpful if you don't want to ruin your floor. It has a very durable playing surface but in order to keep it that way, twisting your darts to remove them would be best. 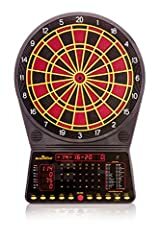 This is another electronic soft tip dartboard that runs on two AA batteries but it also can be plugged in. You are able to have 4 people at each point which gives you some options to work with. It is built similar to the Viper 800 so the bounce out rates are reduced immensely. When you are shopping for an electronic dartboard, make sure you stick to your budget. Make sure you know what features you absolutely need and which ones are not that important. You don't want to have any regrets once you make your purchase. Also, make sure that which ever electronic dartboard you purchase, there is a way to get a hold of customer service just in case you need anything. You're not convinced by the previous writings about electronic dartboards? Of course you can just choose by visual impression, that's why we present you all our chosen products at a single glance. A click on any image is enough to open an external link to the best offer we could find. Finally, we want to present you our rating criteria for our electronic dartboard comparison, so you can better understand and comprehend our recommendations and the rating process itself. Furthermore, we still ask you to keep your eyes open for short term deals in order to make some great bargains with electronic dartboard in 2019. Published by G. Krambs on StrawPoll.com (last update on 2019-04-18 08:05:09). 10 of 14 readers found this article helpful.